Stocks are now poised for a counter-trend rebound. 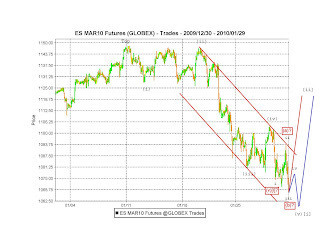 Most likely, the sell-off from Jan 11th high either requires another up and down sequence to finish or has ended today. Chart 1 illustrates the top two potential near term trajectories of the market (using the SPX mini futures as an example). 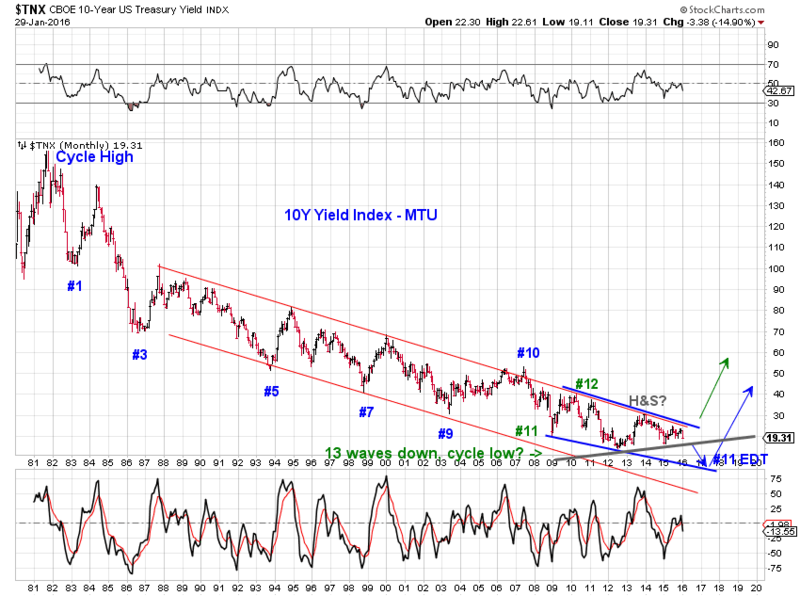 More bearish near term scenarios exist but are of lower probability, in my view. The more important message is that the coming counter-trend rebound ends (and the sell-off resumes), those levels will likely not be seen for months and potentially years to come. On this seventh trading day since I started my subjective countdown on 1/13/10 toward a confirmation of a primary degree trend change, the market has given us the initial confirmation of the top. The nominal topping dates are 1/11/10 (in SPX futures, COMP, NDX, Russell 1000, Russell 2000 futures, Russell 3000, DJ Wilshire 5000) and 1/19/10 (in SPX cash, INDU cash and futures, Russell 2000 cash). In this particular case, a drop below the 11/16/09 high offers the initial confirmation of a top from a EWP perspective. The 11/16/09 high is the top of wave 1 of a potential five (in several indices) from the 11/2/09 low. A breach of this support confirms that the advance since 11/2/09 is a completed three-wave (A-B-C) affair, and in turn eliminates the possibility of the potential five. Today, the 11/16/09 high is violated in all major indices with the exception of the small-cap Russell 2000 index, which may soon follow suit or may have diverged from the rest of the pack. 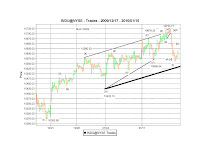 Chart 1 presents the wave count in the form of a triple zigzag of a completed primary degree rally in the ultra-broad Wilshire 5000 Index from March 2009 to January 2010, with the breach of the 11/16/19 also indicated. 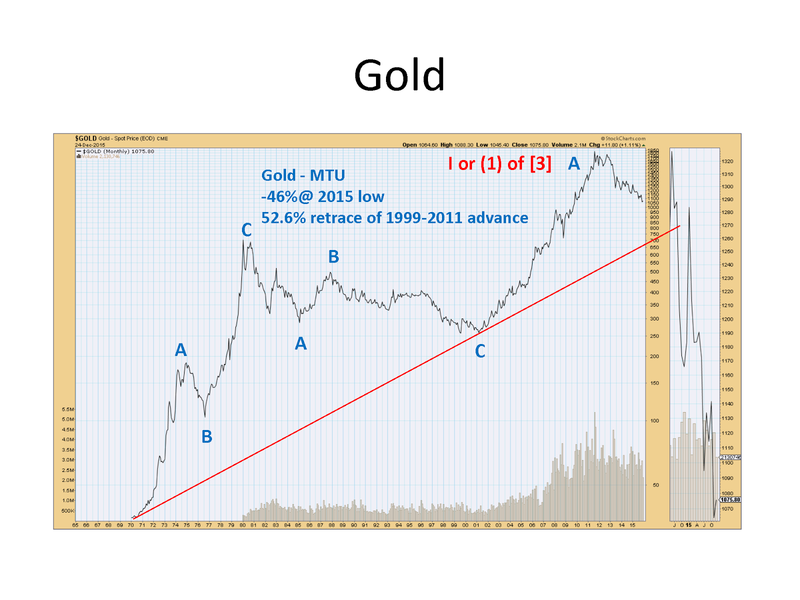 MTU-A primary degree trend change ahead (1/8/10) – The primary degree rally since last March is coming to an end. Stocks may top as soon as the week of 1/11/10. MTU-Stocks Top(ping) (1/13/10) -- The Dow likely has topped. The rest of the indices have lagged behind during Wednesday’s rebound, a sign that they likely have already topped. In retrospect, Wednesday marks the actual high in the Nasdaq and Russell indices, as well as in the SPX futures. MTU-Stocks Top(ping), day 2 (1/14/10) – The Dow and SPX cash indices subdivided higher, but are well advanced in their topping process. In retrospect, Thursday marks the actual high in the Dow and SPX cash indices. 1/15/10 – The Dow -1.24%, SPX -1.08%, Comp -1.24%, RUT -1.41%. Friday’s decline gives an initial indication of the top. Within the ending-diagonal description of the recent wave structure, there’s a chance that Friday’s low is wave [d] (especially in SPX), to be followed by a wave [e] run-up to the top. Thus my countdown to the top should continue until we have an initial confirmation of the top. A further decline that takes the indices out of the ending diagonal territory would be an appropriate initial confirmation. 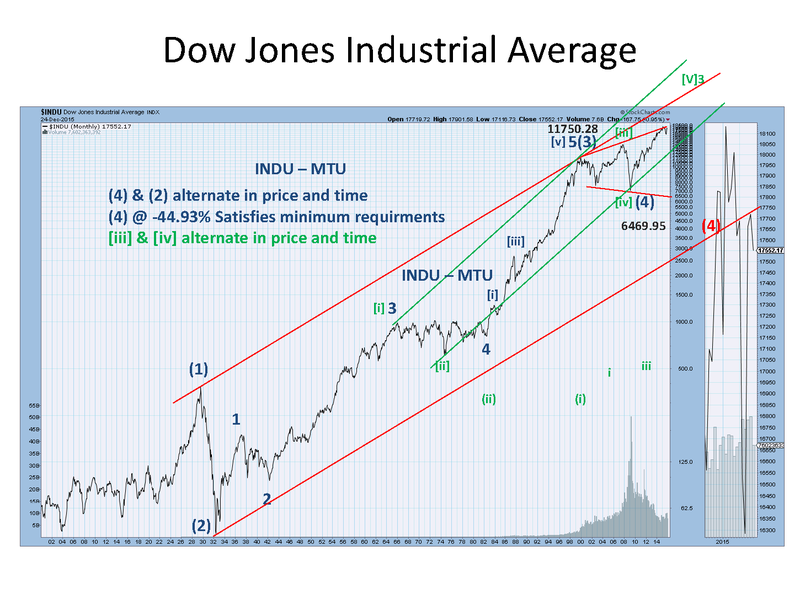 Chart 1 offers my count of the Dow’s trajectory over the past month. The primary count assumes that the Dow has topped and today’s low is wave [i]-down within a NEW down trend and wave [ii]-up rebound is in progress. The alternative count assumes today’s low is wave [d] of C and wave [e] of C is in progress toward a fresh high. 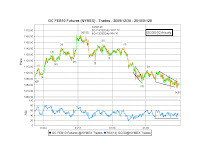 The thick line indicates threshold levels that will give an initial confirmation of the top – around 10540 in the Dow or just a few basis points below Friday’s close of 10609.65. Why is this particular top such a big deal? Because there’s a non-negligible chance that the New down trend goes beyond a typical 10-20% correction by retracing the entire rise since March and possibly much more. If that were to happen, it would surely be very disruptive to most people. For a list of top scenarios regarding market’s intermediate term (next 1 to 3 years) trajectory from an EWP perspective, please see discussions in A New Year’s Resolution (12/31/09). As if to accentuate this risk, the entire rally counts well as a triple zigzag (which is corrective and indicates a bear-market rally) rather than a five-wave impulse wave (Chart 2). Moreover, it will stretch things to count what’s labeled as (5) in Chart 2 as a five if the top is in already. In other words, a new high is likely necessary to achieve a five for wave (5). The advance in stocks since last March, most likely a primary degree rally, is coming to an end based on its wave structure, along with other fundamental and technical considerations. Based on the wave structure, I think we can expect SPX to peak as soon as next week. The subsequent primary degree decline will be substantial. Please see my thoughts on how we fit the coming sell-off into the big picture in A New Year’s Resolution (12/31/09). The rally since last March is best counted as a triple three, most likely a triple zigzag as indicated by the blue labels in Chart 1. Under this interpretation, the recent upward crawl has the distinct look of an ending diagonal, potentially a couple of them at various degrees. The 1/7/10 pre-market low is likely the end of a small degree fourth wave (say a minute degree [iv]), and Friday’s rally into the close is wave (c) of [v] of C as indicated in Chart 2. Wave (c) equals wave (a) of [iv] at 1142.75 in the March SPX mini contract (or about 1146.46 in SPX cash). 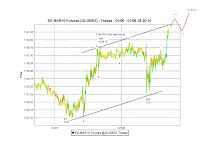 It equals 1.618 times wave (a) at 1150.01 (or about 1153.72 in cash). Both targets are less than 1% away from Friday’s close. There’s an element of uncertainty (mainly with respect to the longer term outlook) whether this particular non-overlapping triple-three is actually a five, as indicated by the green labels in Chart 1. However, we can nail down the maximum upside potential if we indeed have a five on hand. Since wave (3) is smaller than wave (1), the highest level SPX can achieve in this case is 1261.42, about 10% above Friday’s high. It is not clear that SPX can reach 1260. 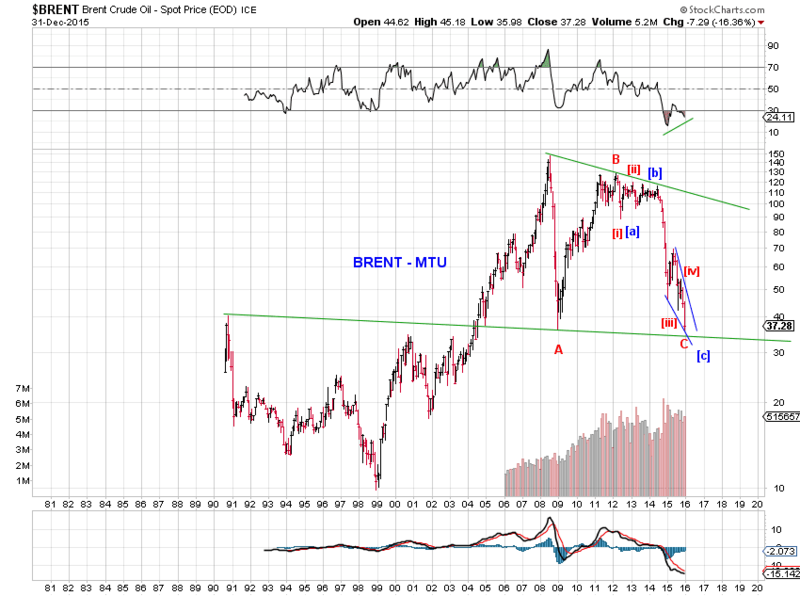 Wave (5) so far looks like a large ending diagonal at best. In other words, the top may be quite close as well, even if the entire rally is a five. This class of counts (Chart 1) all point to the final squiggle (Chart 2) being in progress. If so, expect the final squiggle to be completed overnight or tomorrow. See charts.